“It is a big honour for us as miners to get Fairmined Certification for the first time in Mongolia. When we heard the news, we were all so excited. All of us worked very hard to meet the requirements of the Fairmined Standard during the last 2-3 years.” Said Mr. Ch. Otgonbaatar, head of XAMODX. The story of how the mining community came to be, begins back in 2006 when difficult conditions led herding communities to search for alternative livelihoods to survive the “dzuds” – extremely hard and cold winters that raged for consecutive years killing large herds of livestock. This situation, right in the aftermath of Mongolia’s economic transition when unemployment was on a rise, made the herding community move to an abandoned mine site called Tsagaan tsakhir in the Bayan-Ovoo Soum territory. It is there they began to focus their activities on mining – their only available alternative to herding. Since then the miners have worked hard to make mining a sustainable livelihood and now, less than ten years later, they claim the title as the world’s only organization with Fairmined Ecological Certification. It is thanks to the support of the Sustainable Artisanal Mining (SAM) Project of the Swiss Agency for Development Cooperation in Mongolia that XAMODX is now one of four certified Fairmined organizations in the world and the first of its kind in Mongolia. 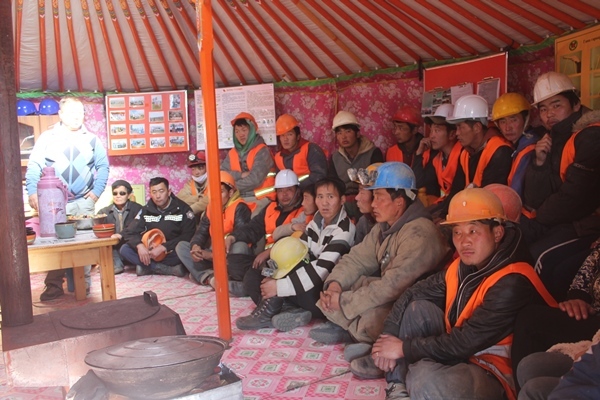 The SAM project’s goal is the increased formalization of Mongolia’s artisanal mining sector while strengthening their social and environmental responsibility, formalization of ASM supply chains for sustainable livelihoods and tangible contribution to local and national economic development. On their way to certification, the SAM project supported XAMODX with organizational capacity strengthening, safety and environmental training and mining site management. “It is a very big opportunity for local artisanal and small-scale miners to get Fairmined certified and to be increasingly known in Mongolia as well as in other countries. This will show how Mongolia’s responsible artisanal miners work as independent organizations according to the laws and regulations in the country. We will share all our experiences with other mining organizations in the country as well as in Asia” Says Mr. L. Byambadorj, member of XAMODX mining community. “I want to congratulate XAMODX and the SAM project on this incredible achievement that represents a new milestone in the industry. We are honored that the SAM project and other allies recognize Fairmined Certification as the number one tool to transform artisanal and small-scale mining and join us in expanding the benefits of Fairmined to more miners.” Said Lina Villa, Executive Director of the Alliance for Responsible Mining.